If we understand design broadly, to mean purposeful action. And if we attribute broad motivations, that is: purposeful action that seeks to serve the public interest or common good, an extended sphere of relation. Assuming that not all such design efforts are equally effective, one might therefore seek to distinguish among their effectiveness. And it might be possible to develop guidelines or principles for distinguishing among design efforts. A lot of people have created lists of such guidelines or principles, and I’m going to start collecting them here. First up: Gar Alperovitz, whose heavy rap and case for regionalism I wrote about last week. 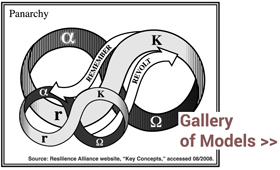 It is possible to begin to clarify the parameters of a systemic model (1) to which the various emerging trajectories of institution-building and democratization point — and (2) which are suggested by the logic of longer term challenges being created by issues of political stalemate, of scale, and of ecological, resource and climate change. Different in its basic structure both from corporate capitalism and state socialism, the model might be called “A Pluralist Commonwealth” (to underscore its plural forms of democratized ownership) or “A Community Sustaining System” to underscore its emphasis on economically and democratically healthy local communities, anchored through wealth-democratizing strategies as a matter of principle. Four critical axioms underlie the democratic theory of a model that builds on the evolving forms and on structural principles appropriate also to the larger emerging challenges:  democratization of wealth;  community, both locally and in general, as a guiding theme;  decentralization in general;  and substantial but not complete forms of democratic planning in support of community, and to achieve longer term economic, democracy-building and ecological goals. This paper was presented at the 2012 American Sociological Association Real Utopias conference, hosted by Erik Olin Wright, who comments on the Pluralist Commonwealth design.